Classic striped crochet hat – make it now! Versatile. Comfy. Stylish. 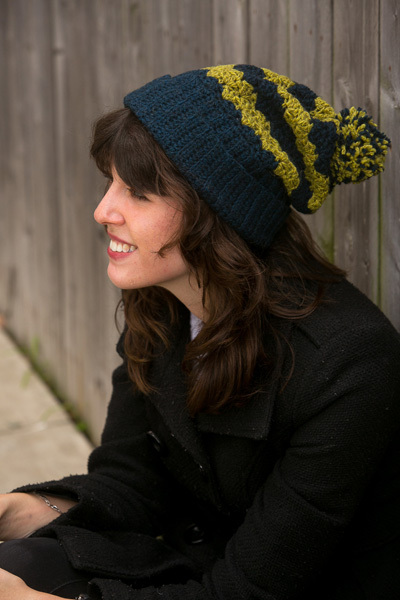 Crochet this hat today! Everyone needs a simple striped crochet hat, and this one is full of interesting details. You’ll crochet stripes in two colors with a wide, ribbed brim that folds up and is topped with a pom pom—just the thing to add a touch of whimsy to classic stripes. Kristen TenDyke’s designs are loved for their substance, style, creativity, and for being just plain fun. Her fans at I Like Crochet are always so excited when a new pattern comes out! The Whimsical Striped Hat is crocheted from the brim up, beginning with snug ribbing that is so attractive and really keeps the hat in place. The brim is worked back and forth, and Kristen added a clever slip-stitch row halfway up the brim piece, so that it folds up and stays folded. No rolling down and covering your eyes! After you’ve completed the brim, it’s sewn together, and you work the body of the hat off of one edge; from then on, you’re working the hat in one piece in rounds. The stripe sequence is a simple three-round cluster done in alternating colors. Take a look through your worsted-weight stash for yarn for this hat or take a trip to a local yarn shop and choose your favorite shades. This would be a great pattern for school colors—go, team! The Whimsical Striped Hat is designed for two colors, but who says that’s a rule? Make it even more fanciful and crochet it in a rainbow, using a different color for each stripe. Then use a few strands of each color in the pom pom. Stripes are such a simple yet effective pattern, and the Whimsical Striped Hat is flawlessly fresh and slouchy; it’s perfect for any fashion-forward guy or gal. If you have a weekend of crochet time, then you can complete one (or maybe even two!) of these hats… one for you and one for a friend. 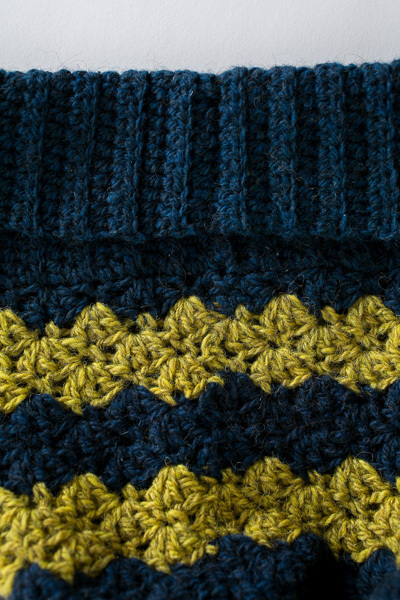 You’ll find the Whimsical Striped Hat pattern in the I Like Crochet pattern library. And, did you know you can have access to it anywhere you go? Just become a Gold Club Member, and you’ll be able to view this fun and easy hat pattern on your desktop, laptop or tablet—whichever device you prefer!